Disney is playing the mouse card with the latest iteration of its "Where's My...?" mobile games. Disney first rolled out Where's My Water? back in 2011 and in its first year it rang up more than 100 million downloads. The game also became the answer to a trivia question when Chunli Fu downloaded the app early last year and it became the 25 billionth app downloaded from the Apple App Store. Ms.Fu won a $10,000 Apple Store Gift Card from Apple for being the lucky person to have installed the milestone app. Rolling out the heavy artillery, the newest game in the series is Where's My Mickey? Disney usually reserves the Mouse's appearances for those times when it needs to call upon the rodent's drawing power. And with the amazing popularity of Rovio's Angry Birds in the mobile space, it could be that Disney executives are getting a little concerned. On Monday, Hasbro and Rovio announced a partnership that will allow the toy maker to produce physical games and toys based on the Angry Birds games. In an ironic twist, one of those games is Angry Birds Star Wars which is based on the characters created by George Lucas that are now owned by Disney! Where's My Mickey? will be available starting this Thursday for iOS, Android and Windows Phone bringing 100 physics puzzles spread out over 5 chapters. 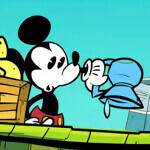 The game, which will feature cameo appearances by Pluto, Goofy and Donald Duck, is being planned around a new series to hit the Disney Channel on July 12th entitled Mickey Mouse. Aimed at those 6 to 14 years old and their families, the animated series is actually a stroke of Disney-inspired genius. The characters will have that 1930's animation look to them while the backdrop for the episodes will be real life cities like New York, Venice, Paris, Tokyo and Beijing, drawn from 1950's and 1960's cartoons. Check out the video below for a sneak preview. In battling Rovio, Disney has a much more diverse set of characters it can draw on. A series of webisodes reached more than 100 million viewers on You Tube. And now that Disney's big star has his own mobile game, the Burbank based firm is focused on shooing away some Angry Birds that would like nothing better than to devour the Mouse. Respect to them for rolling it out to windows phone. The fact that it is disney is a good thing. I'm not sure about the quality of the app itself, but the fact that a major developer such as disney is launching their app to windows phone shows that the platform is now starting to become an os that developers actually consider when developing their apps. This suggests that the future is bright for windows phone. wp has started to be in list of launch day platforms. good for customers. where have you been in the last 4 years symbian is bye bye now my friend ! I know that, but Symbian is not a bad os. It has great multimedia features like hdmi, usb-otg, my phone has stereo speakers. Not to mention multitasking, which is way better than wp. My mum bought Lumia 900 two months ago. Wp is very good os, but it's hard for me to leave live multitasking, hdmi, usb otg, file manager. I think I'll go for Blackberry Z10, because it has flash player, better keyboard, hdmi port, usb otg support. TRY THE NEW JOLLA PHONE ;) !